President, Uhuru Kenyatta (file photo). President Uhuru Kenyatta is completing five years in office by reaching out to two of the world's most influential countries in the East, just as he did at the beginning of his term. On his tour of Beijing this week for the Belt and Road Forum, the President also met with Russian counterpart Vladimir Putin, the first face-to-face meeting between these two leaders. The meeting, in an exclusive room at the Lanqi Lake Convention Centre on the northern outskirts of Chinese capital happened on the sidelines of the Roundtable Summit of the forum, where 28 leaders from across the world had been invited to Beijing to talk about trade connectivity. Foreign Affairs Cabinet Secretary Amina Mohamed said this signalled the start of what could be renewed engagements with Russia, an influential country in the United Nations. "We attended a meeting where there were these other countries participating and the issues that we raised drew lots of interest from some of these countries." "They (Kenyatta and Putin) had a discussion and I had a discussion with my counterpart (Sergei Lavrov). I invited Mr Lavrov to come to Kenya and he said he is going to look at it and give a response very soon," said Ms Mohamed in a briefing to journalists. China and Russia were the earliest countries President Kenyatta visited in his first year in office. At the time, State House said it was "seeking new markets" especially after a series of travel advisories by the West which has traditionally been Kenya's largest source of tourists. With China, Kenya has made pledges worth more than $5 billion in various projects. In the last ten years, China has signed agreements directly amounting to Sh47 billion worth of projects such as the Standard Gauge Railway, roads, power plants, ports and housing contracts. The situation has changed since 2013, most of the advisories have been lifted and the President no longer carries the burden of the International Criminal Court which foreign relations experts thought had influenced his choice of the East. In fact next week, President Kenyatta is due to attend the annual summit of the Group of Seven (G7) in Rome, Italy on the invitation of the group. The G7 represents the world's industrialised democracies US, Canada, France, UK, Germany, Italy and Japan and meets annually to discuss economic governance, security, and energy policies. But it appears Kenya's drive to reach out to Russia is still unfettered. Ms Mohamed wouldn't divulge the agenda of the leaders' discussions promising to brief journalists later on the matter. 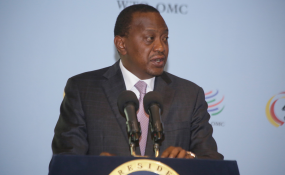 But President Kenyatta has often said his foreign policy is inspired by economic diplomacy. Though they have enjoyed diplomatic relations since Kenya's independence, Nairobi and Moscow's relations remain underutilised, according to Russian Senate Speaker Valentina Matviyenko who visited Nairobi in October 2015.
goods worth $137.5 million mainly tea, coffee and flowers. Russia is the only country among the five Permanent Members of the UN which Kenya enjoys a favourable trade deficit. When the Russian Senate Speaker visited Nairobi, President Kenyatta lamented that trade between these two countries remains low because they use third parties. While top firms in big economies compete for projects in Kenya, Russian companies have often failed to win any contract of do not bid at all. With the first contact this week, argues CS Mohamed, "opens up lots of doors."